The most well-known member of the Osmond dynasty is Donny. The precocious little five-year-old that made his first appearance with his brothers on The Andy Williams Show became a bona-fide star in the early ‘70s. The Osmonds’ albums seemed to be a vehicle for Merrill’s lead vocals but his brothers – including Donny – always had their time to shine. Since Donny’s solo spotlights on the albums were well-received, he was given his own solo contract. Although he toured as a member of The Osmonds and sang on their albums, he released solo material concurrently. It may have been confusing for some, but it certainly helped both parties in the long run. By the time the ‘70s started winding down, The Osmonds stepped backed and Donny & Marie took over. Commercial success dipped throughout most of the ‘80s but Donny was back with a hit single and album by the time the decade came to a close. Since then, Osmondmania has continued to brew thanks to the internet. From official websites to YouTube to Facebook, Donny and Co. have never been more in touch with their fanbase. And vice-versa. In 2017, Donny played a sell-out arena tour in the UK, a country seemingly filled with devoted Donny fans. The audience reaction was so amazing that they decided that the final performance at the Birmingham NEC would be filmed and recorded for posterity. And guess what? Posterity has arrived! 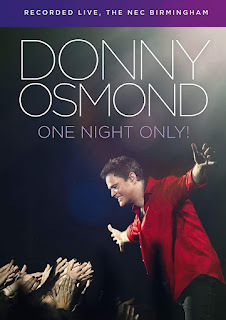 DONNY OSMOND: ONE NIGHT ONLY is a fantastic souvenir of that show, a tour-de-force performance that not only features Osmonds hits but also takes in songs originally recorded by The Beatles (“The Long And Winding Road”), Steely Dan (“Peg”), Mark Ronson & Bruno Marz (“Uptown Funk”), Kool & The Gang (“Celebration”) and many more. 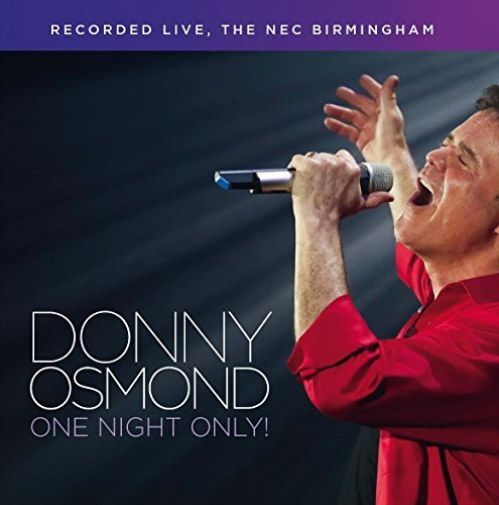 Interestingly, when he tackles songs from the Osmond catalog, he overlooks many of his own hits and focuses on songs that his brothers sang lead on (Jimmy’s “Long Haired Lover From Liverpool,” Merrill’s “Love Me For A Reason,” and Jay & Merrill’s “Crazy Horses”). While he is probably tired of singing his own hits year after year, it is nice to hear him paying tribute to his brothers by putting his stamp on songs they sang. But don’t fret - he does some of his own hits including “Puppy Love,” “Sacred Emotion,” and “Soldier Of Love”. Not surprisingly, he sounds comfortable with all of this material and gives 110% of himself to each and every performance. From the get-go, Donny is on top of his game, having fun with the audience while poking fun at himself. This is the look and sound of a man that still loves to entertain. And by the reaction of the audience, Donny Osmond is still the greatest entertainer in the universe. Critics be damned, the audience is always right!